If you are considerring insulating under the floor you will have a number of options. 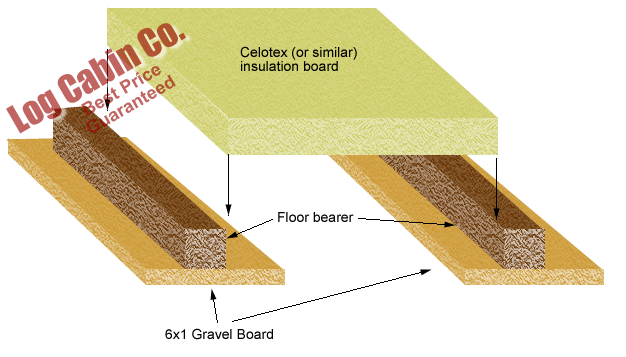 Probably the easiest and most cost effective is to place 50mm thick Celotex (or similar) boards between the joists before laying the floor boards. Ensure the timber you use is pressure treated for outdoor use. Cut the 50mm insulation board to width and place between the floor bearers. By keeping the insulation board away from the concrete prevents moisture ingress and allows for ventilation under the cabin. Once the insulation board is in place, you can board over with the supplied tongue and groove boards.